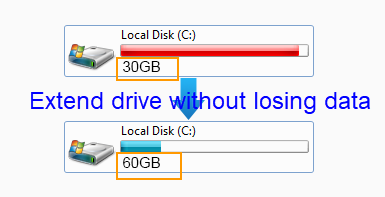 Is there any free partition resizer software to shrink or extend a Windows Server 2003 partition? This page will show you how to resize the 2003 partitions. Download IM-Magic Partition Resizer Server for Windows Server 2003 to manage server disk partition without reformatting server disk nor reinstalling server OS. How to Extend System Partition on Server 2003 for Free? Is there any free partition resizer or partition software available on the market? Especially for Windows Server 2003, or the R2 edition, SBS? There are free partition software for Windows PC users, ie the platform of Windows Vista/7/10 etc, but just no partition software free for Windows Server 2003. If there is no free program available on the market for the server edition, then choose a program with the best price and best performance. The only way to avoid system partition from running on low disk space is to maximize its capacity by extending the partition. There are many commercial tools from serveral developers. Some of them are IM-Magic Partition Resizer Server 139USD, Aomei Patition Assistant Server 159USD, Paragon Partition Manager Server 199USD? Price may change by its developers. IM-Magic Partition Resizer is a dedicated partition software provider who only works on disk partition software with its roll-back technology to protect server OS while changing disk partitions. Move the arrow to shrink the selected partition. Then you can see an unallocated disk partition shown beside the selected partition. Move the unallocated disk partition close to system partition. Right click system partition and choose "Resize/Move" option. Move the arrow to extend system partition. Click "Apply Changes" button to apply all changes to the partition. Most tech specialist would not want their system breaks down due to the requirements of running their servers for their clients. By using IM-Magic Partition Resizer, it is able to help you resize disk partition without rebooting the computer. The resizing task can be accomplished in a short time after you apply changes to resize the disk partition. 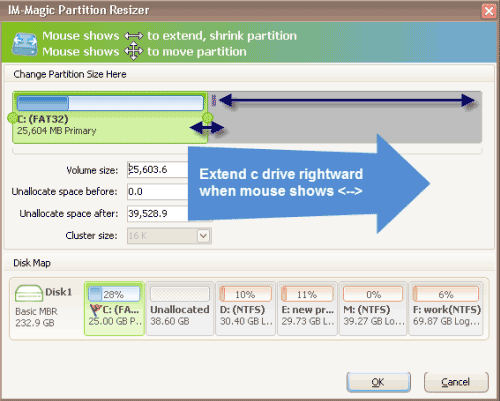 Therefore, IM-Magic Partition Resizer Server is absolutely an efficient partition resizer utility for all Server users.